MOSCOW, March 19. /TASS/. A greater number of Russian citizens abroad cast their ballots in the 2018 presidential election than in the previous election in 2012 and the 2016 parliamentary vote, TASS correspondents report. 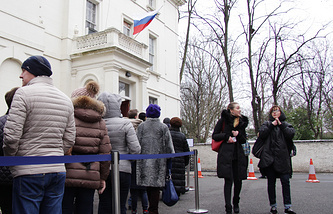 Voter turnout for Russia’s presidential election in the area covered by the Russian Consulate General in New York is outshining figures for previous years, head of the diplomatic mission Sergei Ovsyannikov told TASS. According to Ovsyannikov, the area could set a 20-year record high for voter turnout. Speaking about preliminary data on the number of voters casting ballots, he noted that "in all, there should be around 3,000 [people]." 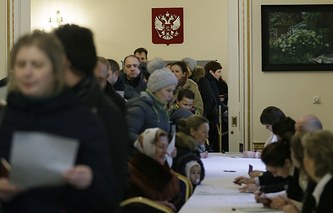 About 3,800 people came to the polling stations in Canada to vote in Russia’s presidential election, Kirill Kalinin, a spokesman for the Russian Embassy in Ottawa told TASS. "We have a record high voter turnout in Ottawa - more than 450 people, while about 900 people cast their ballots in Montreal and about 1,500 people voted in Toronto. For now, about 200 voters came to the polling stations in Edmonton and about 700 in Vancouver," he said. Almost twice as many Russian citizens voted in the presidential election in Argentina compared to the parliamentary elections held in September 2016, the Russian Embassy in Buenos Aires told TASS. According to the local election commission, the embassy issued 456 ballot papers. That being said, just 256 citizens voted in the parliamentary elections in 2016. Meanwhile, voting in the Russian presidential election has come to an end in Brazil, with 511 people taking part in it. On Sunday, three polling stations opened their doors in the Russian Embassy in Brasilia and the Consulates General in Rio de Janeiro and Sao Paulo. 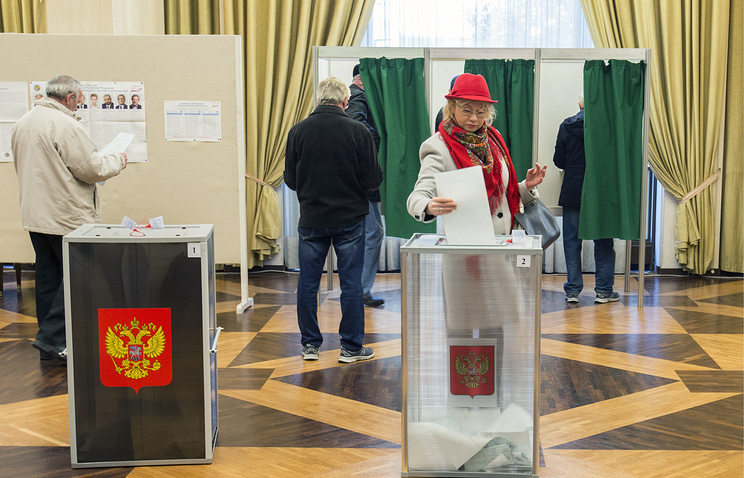 "Compared to the previous elections [to Russia’s State Duma], the turnout nearly doubled. Back in 2016, 108 people came to the polling stations, this time around that number grew to 187 voters," said Russia’s Consul General in Rio de Janeiro Vladimir Tokmakov. In the meantime, Anatoly Sokolov, Minister Counsellor of the Russian Embassy in Colombia, noted that about 150 people cast their ballots as of 12:00 local time, which are pretty good figures for Colombia, considering its small Russian diaspora. Voter turnout in Cuba was very high, having exceeded the figures during the previous presidential election, Chairman of the local election commission, Consul General Vasily Pronin informed TASS. "Voting was very active. In all, 1,735 ballots were issued. The turnout at the current election was about two and a half times higher than in the 2012 presidential election," he noted. Eight candidates were running for the highest office in the Russian Federation. Among them were: incumbent President Vladimir Putin; Pavel Grudinin, director of the Lenin State Farm (nominated by the Communist Party of Russia); TV personality and socialite Ksenia Sobchak (nominated by Civil Initiative); Sergey Baburin, head of the Russian People’s Union party; Maxim Suraikin, chairman of the Central Committee of the Communists of Russia party; Boris Titov, chairman of the Party of Growth and Russian Presidential Envoy for Entrepreneurs’ Rights; Grigory Yavlinsky, head of the Yabloko Party’s federal political committee; Vladimir Zhirinovsky, leader of the Liberal-Democratic Party of Russia (LDPR). Incumbent head of state Vladimir Putin is headed for a landslide victory in the presidential race having garnered 76.66% with 99.84% of ballots counted.